Eric Holder doesn’t hate white people. Sorry, Fox News. For a few hours last week, Eric Holder could breathe a sigh of relief. Finally, it wasn’t the attorney general but another African American government official whom right-wingers were smearing with allegations of reverse racism. But Andrew Breitbart and other conservative troublemakers’ efforts to turn Shirley Sherrod into Angela Davis proved so ludicrously unfair that they only wound up enhancing Sherrod’s reputation; even long-time conservative commentator Peggy Noonan is now holding up the once-obscure Department of Agriculture official as an icon of racial reconciliation. So it wasn’t long before Breitbart et al turned their attentions away from Sherrod and back to Holder, their favorite target in the Obama administration for any racially charged critique. In reality, the case against Holder is just as thin (if not thinner) than the one against Sherrod. But, if you watch enough Fox News, you might think Holder has officially changed his name to Malik Zulu Shabazz. The answer, according to Limbaugh and his ilk, is because Holder is doing exactly what his boss in the White House wants him to do: Get Whitey. This argument makes no sense for a host of reasons. Holder’s “nation of cowards” jab was directed at whites and blacks (hence his use of the word “we”). Meanwhile, there’s no evidence that the New Black Panthers actually intimidated anyone, making a successful prosecution of them under the Voting Rights Act all but impossible. But the two biggest strikes against the campaign to discredit Holder are even more basic: One has to do with the attorney general himself, the other with his relationship vis a vis the Obama White House. 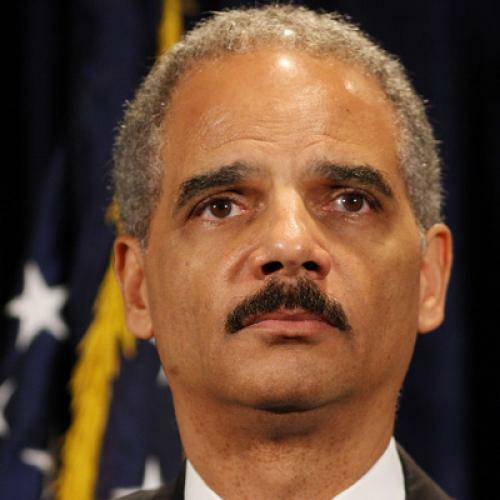 First, Holder has no serious history of racialism, much less radicalism. The guy is about as establishment as you can get. He has spent his entire academic and professional career—save for participating in some student protests as a Columbia undergrad and spending one summer during law school, also at Columbia, working for the NAACP Legal Defense Fund—in the halls of power. After law school, Holder went to work as a lawyer in the Justice Department. Later, he became a federal judge (appointed by Ronald Reagan, no less) before returning to work at the DOJ as Janet Reno’s deputy. And then, before Obama made him attorney general, Holder was a partner at the white-shoe D.C. law firm Covington & Burling. Indeed, much like Supreme Court nominee Elena Kagan, Holder has achieved his lofty position in U.S. politics by not making any waves. Up until he became attorney general, the only blotch on his otherwise perfect resumé was when, as Reno's deputy, he gave the Department of Justice’s now infamous “[n]eutral, leaning towards favorable” response when queried by the Clinton White House about pardoning Marc Rich. The episode, according to critics like Richard Cohen, proved that Holder “could not say no to power”—something an attorney general must do. Which is presumably why Holder seems to be working extremely hard, now that he is attorney general, to do just that. And it’s also why he’s finally making waves—ones that have made his relationship with the White House less than cozy, despite what the conservative media would have you believe. Ignore, for the moment, his repeated clashes with White House chief of staff Rahm Emanuel over Guantánamo detainees and other terrorism issues. Just consider the three major episodes conservatives point to when they argue that Holder, in league with Obama, is grinding some racial axe; in each instance, Holder has actually been working independently of, and, sometimes, at cross purposes with, the White House. After his “nation of cowards” speech, Holder was dressed down by Emanuel and forced to do some extra media training with David Axelrod and Robert Gibbs. No one has produced any evidence that the White House was in any way involved in the decision not to take up the New Black Panthers Party case. And it stands to reason that, in a mid-term election year, the White House would have preferred not to stir up the immigration hornet’s nest with the Arizona lawsuit. But if the conservative case against Holder makes no sense logically, it does emotionally: Like Obama, the attorney general is black, and some right-wingers seem to think that, when two prominent black Democrats are given the reins of power, they’ll surely conspire to undermine white people. Absent any tangible proof to back up this argument, that really is the only way to explain the conservative media’s strange fixation on Holder. He inflames their fears and suspicions in a way that, say, John Edwards—who, a long time ago, in a galaxy far, far away, was considered Obama’s likely choice for attorney general—never would have. Indeed, although conservatives’ mistreatment of Shirley Sherrod was much more flagrant, the motivations behind it are identical to the ones behind their mistreatment of Holder. Maureen Dowd may be right to urge Obama to ditch “the smug cordon of overprotective white guys surrounding him,” but it’s reasonable to worry about the miserable treatment that would inevitably greet any additional black advisers Obama brought into that cordon. After all, if conservatives can turn Eric Holder into a racist caricature, is there hope for anyone else? Jason Zengerle is a senior editor at The New Republic. You can follow him on Twitter at @zengerle.